At the height of the Iraq War in 2007, Jesus Palafox was busy fighting his own personal battle in Chicago: navigating through the system of higher education in the United States as an undocumented citizen. Hoping to study at a four-year institution, Palafox recognized that he faced a monumental challenge of financing the entirety of his college tuition without financial aid or the support of state or student loans — and in many cases, the support of the community at large. Palafox is one of an estimated 2.1 million people who are placed in a state limbo following graduation from the U.S. public school systems, due to a lack of proper documentation, authorization and the financial mechanisms to seek higher employment or education in the country, according to the Center for Immigration Studies. Recent discussions on Capitol Hill and across the nation have aimed to generate legislation to supplement this burgeoning sector of society. Of the biggest legislative namesakes is the Development, Relief and Education for Alien Minors Act — DREAM, which would allow undocumented young immigrants a chance at citizenship provided they attend college for at least two years or enlist in the military. But the idea of the U.S. military acting as a fast track to citizenship has raised many ethical and moral questions, and has left even traditional immigration reform proponents asking what are the true intentions of the legislation, as well as who will benefit the most from it. Over the last decade, America’s “All Volunteer Force” has been put to the test on whether it is a long-term sustainable system that can continue to retain and meet the country’s growing demand for military labor. With two long and increasingly unpopular conflicts in Afghanistan and Iraq, and almost 1,000 military bases around the globe, the U.S. armed forces have been stretched to its limits. The Pentagon has responded to this gradual decline and crisis in military recruitment with several techniques, ranging from tweaking ad campaigns, lowering recruitment standards and even increasing signing-bonuses. But beyond these Band-Aid solutions, the U.S. military has started to draw out a long-term strategy to maintain its massive global presence: immigrants and foreign nationals. Going back to the Clinton administration in the ’90s, which oversaw the beginning years of an era of that would mark the largest migration in U.S. history, there was a recognition in the Pentagon that one of the largest and most promising military-age groups in the coming decades could be immigrants, both legal and undocumented. The practice of recruiting and enlisting immigrants is nothing new for the country, which has traditionally filled critical roles and gaps in its ranks with immigrants, Margaret Stock, a retired Lt. Col. in the Military Police and current immigration lawyer at Cascadia Cross Border Law, said. In fact, Stock said, it is only in recent decades that the U.S. has severed its ties with this historical practice — adopting increasingly strict immigration policies and ramping up security on its borders due to perceived threats of national security from foreigners. This, Stock said, has only further agitated the country’s “complex, bloated and arbitrary” immigration system, by cutting off a traditional pathway to citizenship. Additionally, it has also closed off the army from a growing and critical group of military-aged youth with the high-tech and foreign language skills necessary to maintain security in a globalized world. In a time when the U.S. immigration system and military recruitment services are experiencing high stress, Stock said recently proposed legislation, such as the DREAM Act, could provide relief to both systems — offering recruiters access to a previously off-limits group and immigrants new opportunities to pave their way forward in the country. Nevertheless, while the DREAM Act would offer unprecedented opportunities for undocumented immigrants, Rick Jahnkow, the program coordinator at Project on Youth and Non-Military Opportunities, said its not entirely patriotism that has crafted the legislation, nor is it only a patriotic fervor that would drive undocumented youth to seek citizenship through the military if the bill were to pass. Rather, Jahnkow said legislation like the DREAM Act will create a loophole that only further exposes and exploits an already historically exploited socioeconomic class. “Project YANO has now started looking at the immigration side of [militarization], because we see that as another community that is going to feel disproportionate pressure to carry the burden of war and militarism,” Jahnkow said. 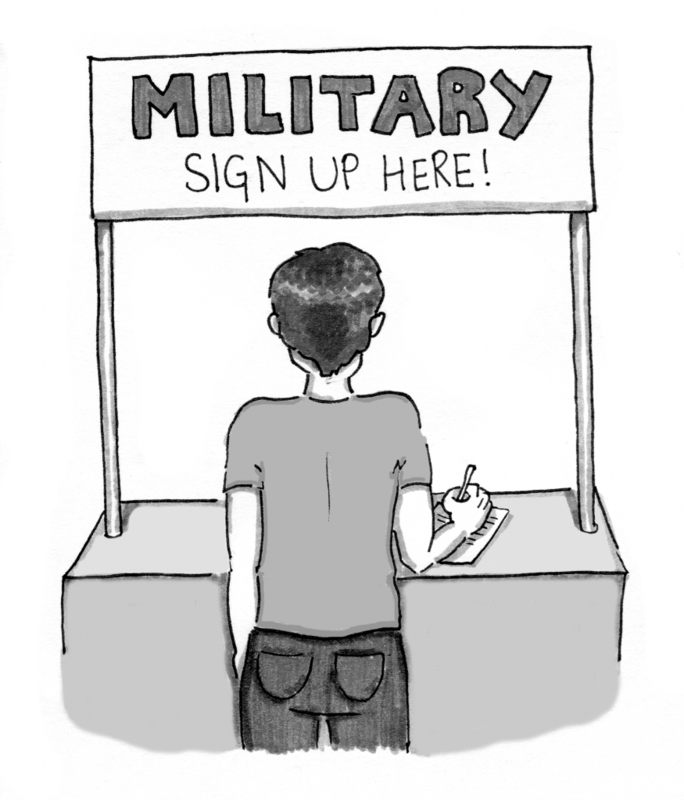 Jahnkow said the military thrives off what is known as a “poverty draft” — a system of recruitment that sells the military as an attractive career option or steppingstone to further education in communities with either real or perceived limitations and options for mobility. While Palafox is barred from accepting any recruitment advances because of his citizenship status, he said that based on his experience, it is evident how the military puts more pressure on particularly vulnerable socio-economic groups throughout the Chicago Public Schools, which he described as one of the most “militarized” districts in the nation. Immigrants and various ethnic groups in Chicago, Palafox said, have been the targets of mass militarization — or a process in which a community gradually comes to be controlled by or dependent on the military or militaristic values — in the school district. The militarization of the city’s immigrant and ethnic population, Palafox said, can be seen in everything from over policing in particular neighborhoods to the school district’s military education programs like the Junior Reserve Officers’ Training Corps or the Middle School Cadet Corps Cadet. According to the Chicago Public Schools Department, the city houses the largest JROTC program in the country, with more than 10,000 cadets, 93 percent who are African American or Hispanic, enrolled in programs at nearly half of district’s high schools as of February 2014. In a school district of 400,545, the military has recognized its struggle to mass appeal to a critical group of military age youth. Palafox said he fears passing the DREAM Act with a military component was in many ways a “strategic move” to open the floodgates to an overlooked and untapped group of homegrown talent. Even with an education option, Palafox said the DREAM Act is not yet the progressive immigration reform the media and critics have heralded it to be. Without the creation of loan based financing or alternative programs for immigrants to help them understand their options, Palafox said, most beneficiaries of the DREAM Act will seek permanent residency through the military — fueling the economic force that currently threatens their daily lives with the fear of deportation. Marissa Framarini is a junior journalism major who DREAMS about more transparent immigration reform…and pizza. Email her at mframar1[at]ithaca.edu.